On a cool, cloudy Saturday afternoon in early May 1967, two men simultaneously spotted the billowing smoke escaping from the first-story windows of Sacred Heart School’s “new building” on its Moore Street campus in Lowell, Massachusetts. John J. McWilliams, an off-duty police officer, ran and activated the fire alarm at a nearby fire-box. John Sickles, a Tewksbury resident who happened to be driving past the scene, drove to the nearby Lawrence Street firehouse and notified the firefighters inside. 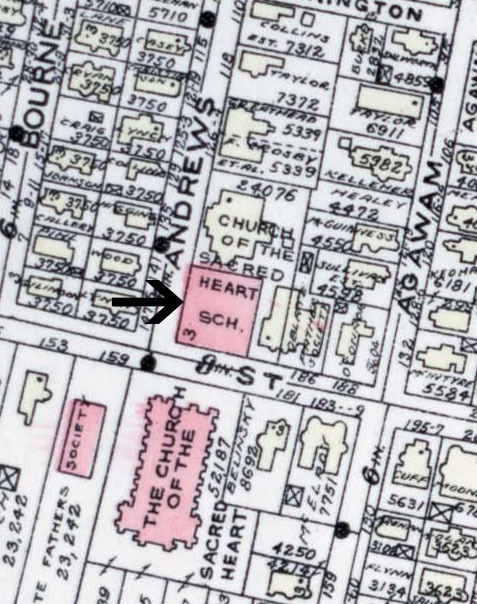 Marked with a black arrow above, Sacred Heart School's "new" building once fronted Lowell's Moore Street. At 58 years old, the “new building” was the newer of Sacred Heart School’s two school buildings on the corner of Moore and Andrews Streets in the city’s South Lowell neighborhood. Its cornerstone had been laid on October 9, 1909 by Lowell native and then-Archbishop William H. O’Connell, who later became a Cardinal. 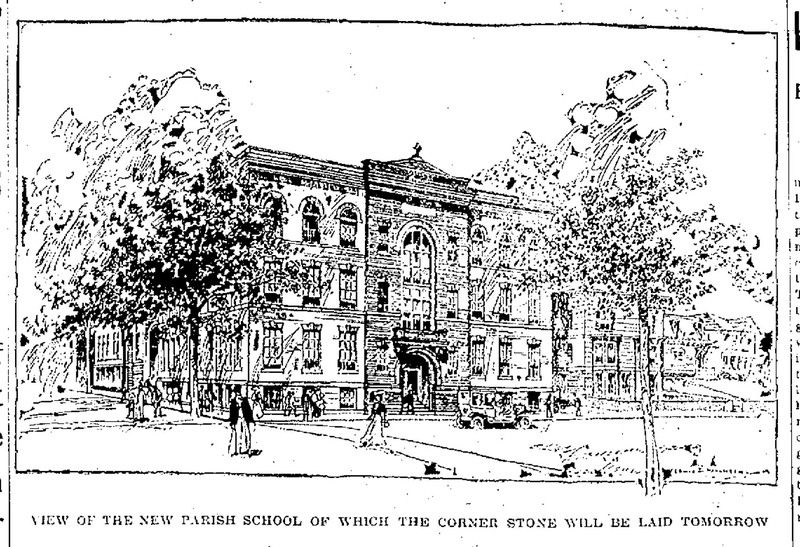 By 1967, the school, which served the children of parishioners of Sacred Heart Parish located across Moore Street, had grown to include the “old” and “new” buildings that served some 600 students, from grades 1-8. The building now burning housed the younger children, through Grade 4. The older children attended classes in the “old building”, which standing just 25 feet away, was threatened by the raging fire too. By the time the first firefighters arrived, a few moments after 2 PM, the fire had spread past the first-floor boys’ lavatory near where it had started, through an air shaft, across the school’s gleaming oil-treated floors, and up the stairwells into its third-floor auditorium. The first alarm company to arrive on the scene, led by Deputy Chief Mulligan, quickly determined that the three-story brick building could not be saved. They soon called for more alarm units. Sacred Heart School’s new building was entirely engulfed in flames before the second alarm units even reached the fire. Five more companies arrived to fight the blaze, and to protect the surrounding neighborhood, tightly packed in the city’s South Lowell section. They also worried for the school’s remaining building, the old building, nearby, but still untouched by the flames. The firefighters called in two more engines. At 2:43 PM, help was called in from surrounding communities outside Lowell. Firefighters from Billerica, Chelmsford, Tewksbury, Dracut, Westford, Tyngsboro, Bedford, and Lawrence all answered the call. Some assisted Lowell firefighters at the fire. Others manned Lowell’s fire stations, while their firefighters fought the Sacred Heart School fire. The inferno was declared a general alarm fire. Veterans on the city’s fire department remarked it was the worst fire they had seen since the 1941 fire that had claimed the Bartlett School, more than 25 years earlier. Firefighters directed the department’s pump-fed, high pressure lines at all four sides of the building. They threw up a water curtain to protect the old building. A few minutes after 3 PM, the fire began poking through the school’s roof. Seven minutes later, firefighters were ordered out of the school when the top of its west-facing wall began to fail, spilling bricks, plaster, and other debris into Andrews Street. Police pushed back the crowds that had gathered along Andrews Street as firefighters risked death and severe injury to remove their equipment from the failing wall. For the next hour or so, firefighters worked to contain the flames while they raced unchecked through Sacred Heart School’s new building. Eight classrooms, an auditorium, the offices of the principal and of the school nurses, and the lavatories were all destroyed. At 4 PM, the roof above the third-floor auditorium failed and fell into the building. Its weight caused the floor of the third story to sag, forcing firefighters to abandon their efforts inside the building and escape using the nearest ladders and fire escapes. More sections of the school’s roof soon failed, allowing firefighters atop aerial ladders clear access to aim their deck guns at the flames. The fire was finally declared under control by 4:30 PM. Smoke towered some 75 feet above the doomed school building as firefighters began to re-enter the building’s first floor and subdue any leftover trouble spots. Chief Gendron left three companies on the scene overnight to prevent any additional outbreaks. One firefighter lost his life fighting the blaze. While helping fellow firefighters raise a 45-foot extension ladder on the school’s Moore Street side, John J. Wojitas, a WWII veteran and a 24-year veteran of the Lowell Fire Department, fell victim to a fatal heart attack. He was pronounced dead upon arrival at St. John’s Hospital (now Saints Memorial). Rev. W. Irving Monroe, the fire department’s chaplain, was on the scene of the fire and left with Wojitas when he was stricken. Rev. Monroe returned to the scene of the fire later, delivering the news that Wojitas had died to his saddened fellow firefighters. The school’s loss weighed heavily on the local community that had gathered to watch the efforts to save the building. Most were graduates of, or otherwise connected to, the school. The school’s nuns, of the order of the Sisters of St. Mary of Namur, stood stricken with the priests of the school’s church, the Oblates of Mary Immaculate. In its aftermath, the school announced that its classes would be cancelled for a few days following the fire. Rev. Frederick Higgins, OMI, acting as the church’s pastor while Rev. John T. McLaughlin, OMI, was recuperating in Florida from an illness, announced that plans to place students in other schools would be discussed. By Sunday afternoon, the day after the fire, a crane had been already put in place to take down the charred ruins of the school. The top two floors of the school were soon condemned and the city’s deputy commissioner of lands and buildings ordered that students not attend class in the school’s old building until those floors were leveled. Some talk was made about saving the school’s first floor, but ultimately, this was leveled too. The Rev. Bruce M. Lambert, pastor of the First United Baptist Church soon reached out to Rev. McLaughlin to offer the church the use of their facilities at Central Plaza at 99 Church Street in Lowell, which included, in his words, “a modern educational wing, with 10 classrooms, accommodating up to 300 pupils, an office and a large open basement recreation room.” Sacred Heart officials ultimately chose to use their old building on a double session basis, for the few weeks remaining in the school year. The school did rise again. On September 22, 1968, a crowd of more than 2,500 people gathered to watch the dedication of the new Sacred Heart School building. Its student body of 500 began classes there on the following day. The Sacred Heart School band provided the crowd with a concert as dignitaries, parishioners, students, alumni, and friends looked on. After the concert, a tour of the new building was given. The cornerstone was laid during the ceremonies by Rev. John T. McLaughlin, pastor of Sacred Heart Parish, and the Very Rev. Thomas Reddy, OMI, Oblate Provincial of the Eastern Province. The school’s principal, Sr. Mary Kevin, SSMN, proudly looked on. As part of the ceremony, Fathers Reddy and McLaughlin passed through the rooms of the new school building, blessing each one, and finished by hanging a crucifix in the principal’s office. After giving thanks to all those who helped in the rebuilding effort, Father McLaughlin told the crowd about the contents of a box which had been sealed into the new school’s cornerstone. The box contained all of the keepsakes that had been sealed in the cornerstone of the 1909 building: copies of The Lowell Sun and the Lowell Courier-Citizen detailing the construction of the first school and its groundbreaking ceremony. In addition to the 1909 items, new keepsakes were added to the cornerstone box: Lowell Sun articles describing the 1967 fire that had destroyed the former school building and the new school’s groundbreaking ceremony, a Miraculous Medal, a Sacred Heart Badge, and a list of all the current priests and teaching sisters. The priests had also added a list of parishioners, a medal of Pope Paul, a Kennedy half-dollar, and a picture of John Wojitas, the fireman who died while fighting the fire that had claimed the old school. By the time I began attending Sacred Heart School more than a decade later, people still spoke of the great fire that had claimed the “new building”. During my first few years at the school, we still attended classes at Sacred Heart’s “old” building, with its quaint coat rooms and ornate woodwork. The building was eventually demolished, ten or fifteen years ago. The school itself closed a few years later. Do you have memories of the fire, or of Sacred Heart School or Church? Please share them here! Note to readers: The Fires of Lowell series includes several other articles, including one detailing the 1904 fire of Lowell’s St. Patrick’s Church. This post marks the fifth installment of the series. For photographs of the Sacred Heart School fire of 1967, please visit Lowell Firefighting’s page on Facebook. I loved this article. My grandfather John Keohane had come out to his cousin Dennis Crowley at 126 Andrew St. in 1912. I have been to Andrew St. several times and wondered about Sacred Heart Church and the school. Thanks Mary Ellen – I’m glad that people are enjoying the blog. I try to provide a good mix of topics to keep it interesting. This one was a little more immediate and personal since I know the school and its history well. It’s also the first time I tried something from the latter half of the 20th century. for me, it was a dream come true! God had finally answered my prayers… no school, I hated every day of it. My four sisters and two brothers attended, we lived on Crowley St. Remember Dan and Simone just down the st? I remember that day well. I could see the fire from my house about a quarter mile away. A group of us were sitting on our front steps and ran like crazy to watch. I remember cutting through Prince Macaroni on the way home and one of the St Peters boys thought the Sacred Heart kids were lucky that their school burned down. We had to go to school Monday but those kids didn’t. BTW, this blog is the best kept secret around. Bill – thanks for the comment – my dad’s family all went to St. Peter’s. That’s another church/school I’d love to cover in a future post. What a terrible thing, but it was so cool to see towards the end that you attended this school and have a personal connection. And to read comments from people who personally remember the fire. I read of Fr.Randall’s passing and was so sad. I can remember his visiting our classroom at Sacred Heart in 6th grade. It was Sr.Mary George’s class. He was such a down to earth and kind person. He entertained and really cared about the kids. I also remember you Billy Sheehan and your fiery red hair!! I made my first Communion the morning of the fire. Watching the family movies of that day we watch me and my friends coming out of the school crossing Moore St and proceeded into the Church. Next seen is us coming out of the Church and going back into the School. After a few poses with family, the priests (Fr McLaughlin) and friends the outside. The ceremony was over. The next shots on the movie were of the school on fire. There are only a few minutes of the fire but it keeps the memories of the day. What a wonderful blog! I have recently been considering blogging about my ancestors in Western Virginia during the Border Wars. I’ve signed up to follow your blog, and hope to learn a lot from you. Thanks for your clarity and wonderful descriptions. Hi Jude – thanks for the comment, and follow! I started out blogging about my ancestors, but later expanded to include much more about the city in which they lived, and the overall region. It’s helped me provide some context to my own family tree, while helping others with ancestors from this area do the same. I remember that day, my brother David also made his First Communion that day. We went to visit relatives and on the way home is when we found out about the fire. I enjoyed this article too with a personal connection to the story. My deceased father, Rev Bruce Lambert, was referenced in the story. He was relatively new at the time as pastor of the First United Baptist Church in Lowell. 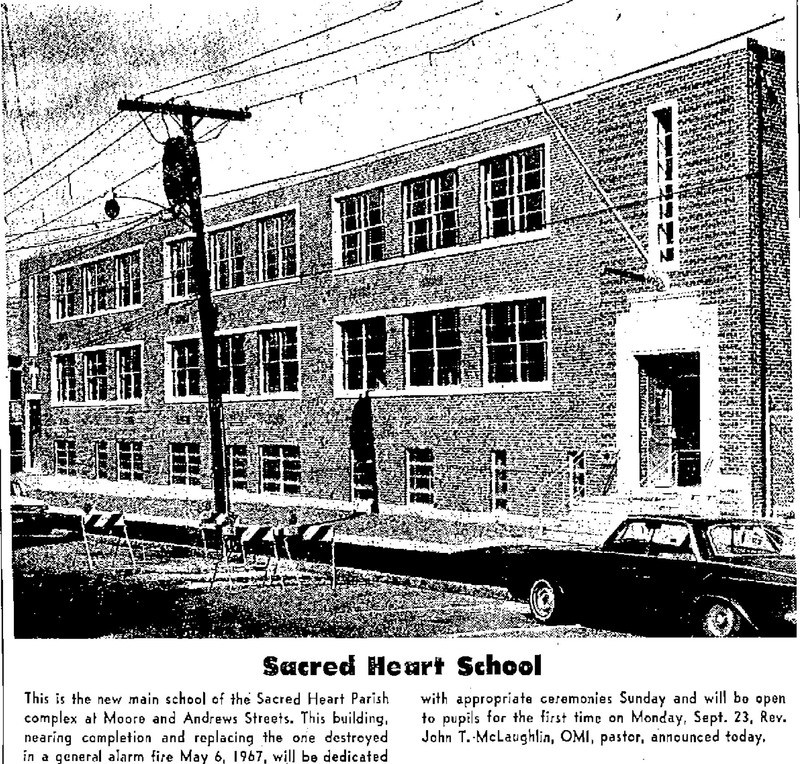 The church had a ~7 year old Christian education building that was offered up as a temporary home for the Sacred Heart School. During those years starting in the mid-60s, there was a growing ecumenical effort among the Greater Lowell Protestant ministers, Jewish Rabbis and Catholic priests. I remember those years and that effort with great fondness. I remember hanging clothes on our clothes line with my mother the afternoon of the fire, and seeing the smoke billowing through the sky. To find out that it was the school. I still to this day have the children’s bible that my parents gave me the day I received my first communion, which went through the fire. Thankfully it only sustained slight water damage. This article brought back so many memories, thank you for sharing. I was pretty small but I watched that fire. I remember being terrified. I also remember the statue of the Blessed Virgin that they recovered from that fire. She was still intact but her head was bowed down from the heat after that and she was kept in the principal’s office. I also remember the double sessions and the excitement when the new building opened. Such memories.